At some time, most people will have had an evening of sitting in a drive-in and waiting, with baited breath, to watch the latest box office blockbuster only to be frustrated when, because it was a bright moonlit evening, it was near impossible to see the movie. 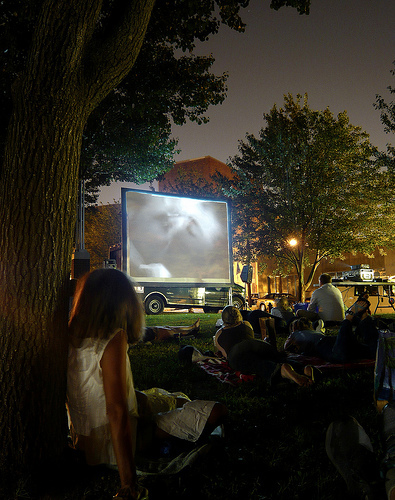 The outdoor screens that are used in a drive-in cinema are specially designed to be far more reflective than a simple painted screen but they still need complete darkness to work well. The use of LCD screens certainly made indoor viewing a lot better. Improved brightness and contrast meant that the lighting conditions were far less critical than it was with the old CRT screens. Despite this, liquid crystal displays have proved to be far less effective than LED panels for outdoor screens. Apart from their obvious size, there are some distinct differences between the LED screens that are used at outdoor venues and the LED TV sets that we watch in our homes and sports bars. Although both offer greater brightness, contrast and clarity than LCD and plasma, they actually use different technologies. The TV set utilises individual diodes to backlight a screen, is smaller and ideal for close viewing while the larger outdoor screens employ clusters and are best viewed from a distance. The distance between the clusters is known as the screen’s pixel pitch and a small value, of say 3mm, is ideal for close indoor viewing while a 30mm pitch would be best viewed from much further away. This can mean a big cost saving when used for any of the larger entertainment events such as at an international sports stadium or an outdoor concert venue. Buying outdoor screens for a one-off event would not really be very sound economics. For this reason, companies that sell them will normally also offer their clients the option to hire them. Whether you plan to buy or rent a screen, contact us for expert advice on a big screen solution that will work for you.